Most importantly, once you have the book, you don’t need any other resources. You’ll need some basic tools, but he spells out all the processes the first time he introduces them. you to give this a shot. The first lesson is braised lamb. What is a braised anything? Braisingis a combination cooking method using both moist and dry heat; typically the food is first seared at a high temperature and then finished in a covered pot with a variable amount of liquid, resulting in a particular flavor. For this lesson, we (Tim and I, of course.) skipped the searing. It’s easier this way, and still comes out great. There are two critical ingredients to Osso Buko. First, the meat. I was supposed to have lamb shanks. 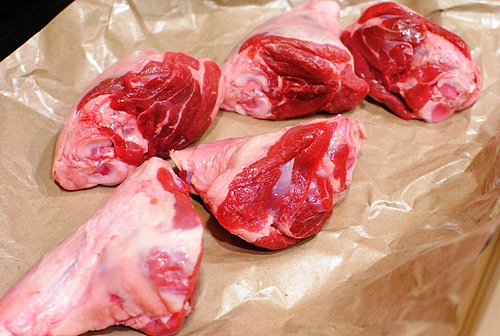 Where the heck do you get lamb shanks? 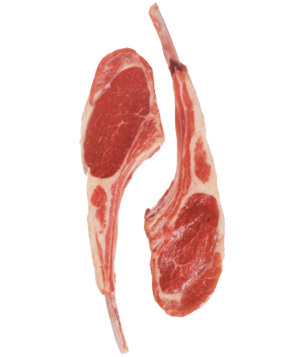 I went to a local Giant and poked around their meat department for a while, and could find nothing that looked like what Tim had in his book. Since I was cooking for three later that evening, I just grabbed meat that said “lamb” on it, and also had visible bone. Turns out I had gotten lamb chops. Oh well. I had my meat. What was the other critical ingredient? Not an ingredient, per se, but a tool. I had to use a cast-iron dutch oven. I’ve never owned anything cast iron, and there was no cast iron cook wear in my house growing up. My uncle introduced me to it when I lived in his basement after I finished college; he is an excellent cook, and he swears by the stuff. Since he is a trustworthy source, I did not protest much to the idea of getting a cast iron dutch oven. Especially since this dutch oven by Lodge is both a pot and a skillet. 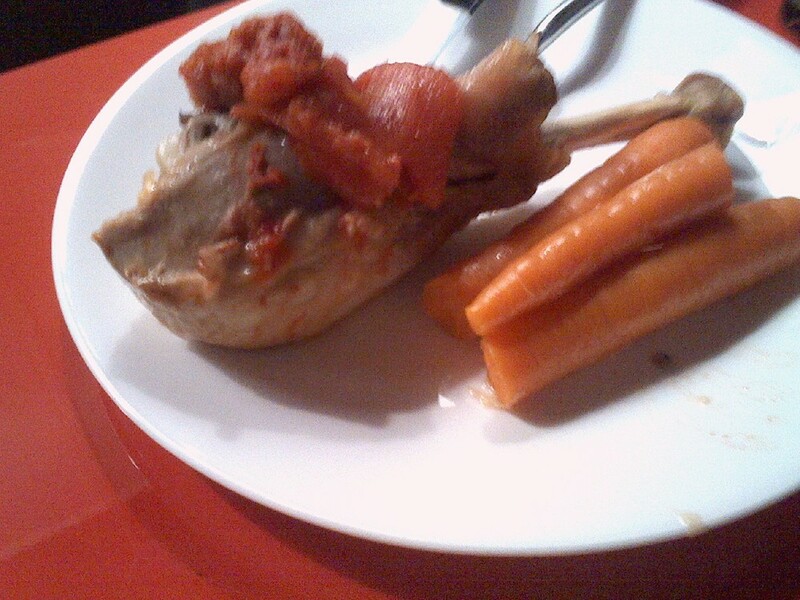 Now that I had my meat and my pot, I put everything in the pot (carrots, lamb, canned whole tomatoes, a little garlic, extra-virgin olive oil, and some white wine) and I stuck it in the oven for two hours. It came out delicious, and tender. Everything was edible, including the carrots and the tomatoes. Lessons learned: While meals may be simple, it can be a real pain finding the correct ingredients. The chops I got were not at all what I was looking for, but it was the only lamb I could find. If you know where to get good lamb shanks, let me know. I eventually ended up getting turkey thighs instead of lamb shanks, just so I could have a better idea of how it is supposed to go. 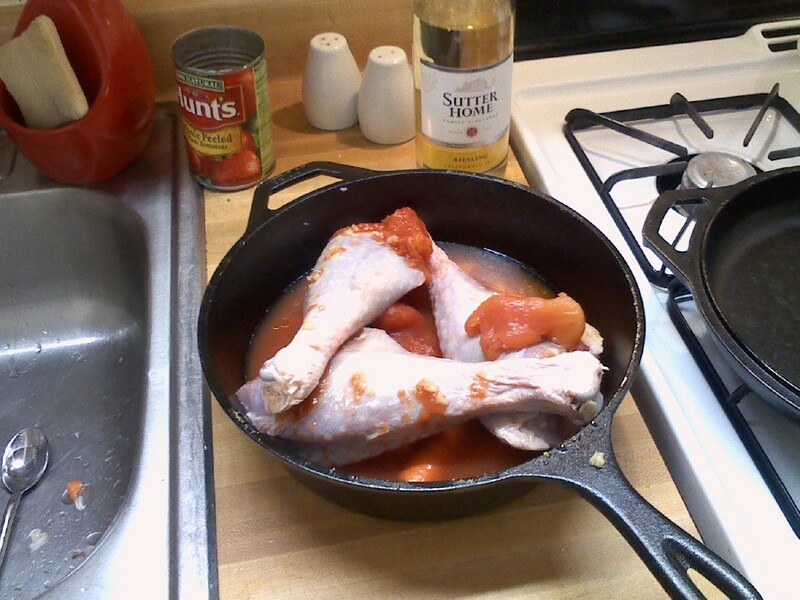 It worked out, but I’m not a huge turkey fan, so… I’m going to keep looking for lamb shanks. The very next page, after the Ossu Buko, was a variation of braising using just a chuck roast, and three different cans of broth. Put everything together in the pot, and bake for 2.5 hours. Seriously. That easy. It was delicious. And there was lots of left overs. 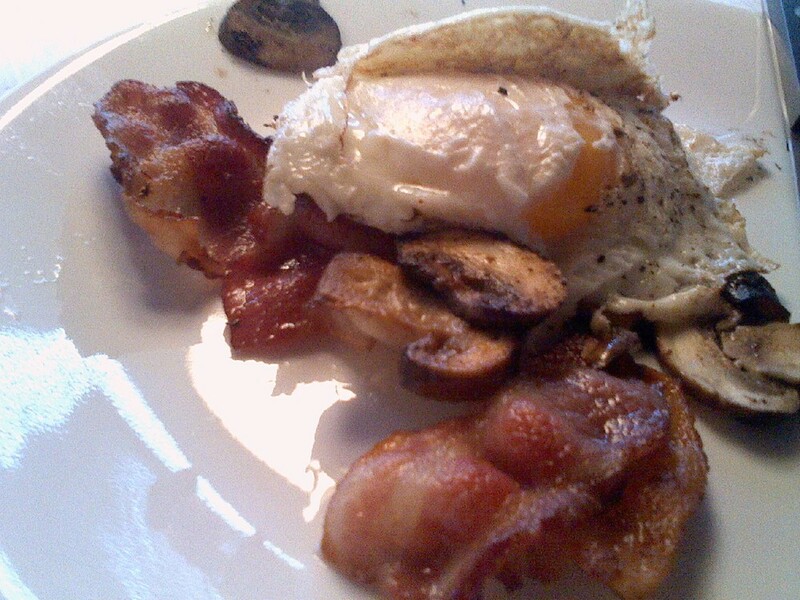 I’ve been eating three eggs and bacon for breakfast every day for at least two years. Repetitive, yes, but healthy (in some circles. Unhealthy in others. Guess which camp I am in?) and easy. I don’t scramble them, I just put ‘em sunny side up and mop the yolks with the bacon. I’m stuck in the rut of sunny-side up eggs and bacon, though, so after a few days of playing around with scrambled eggs, I settled back into my old habits. Tim lists around the world in 44 flavor combinations as suggestions to get a feel for different cuisines With just a few basic spices, you can get from Mexico to India to the Middle East to Greece to Hungary and more. I experimented with scrambled eggs for a few days, but I just love my sunny-side-up eggs cooked in a little bacon grease. It’s quick and easy, and oh-so-filling. This was my first total failure. I screwed up the ingredient ratios, and found out I didn’t have curry (I thought I did) so I unintentionally steamed a bunch of cauliflower that was too hard to mash, yet still soft enough to eat plain; I had cauliflower leftovers for a few days. The upside is cauliflower steamed with coconut milk is delicious, even if it can’t be mashed up like mashed potatoes. For “total failure”, it was no big loss. My biggest challenge for this lesson was finding zucchini! The two local Giants that I visited didn’t have ‘em. Once I found out that zucchini is basically a squash, I had better luck finding it. (Cucumbers, on the other hand, are not interchangeable!) I also did not have the Ghee (clarified butter) or chilli pepper. I used red pepper flakes, instead, and some regular butter. 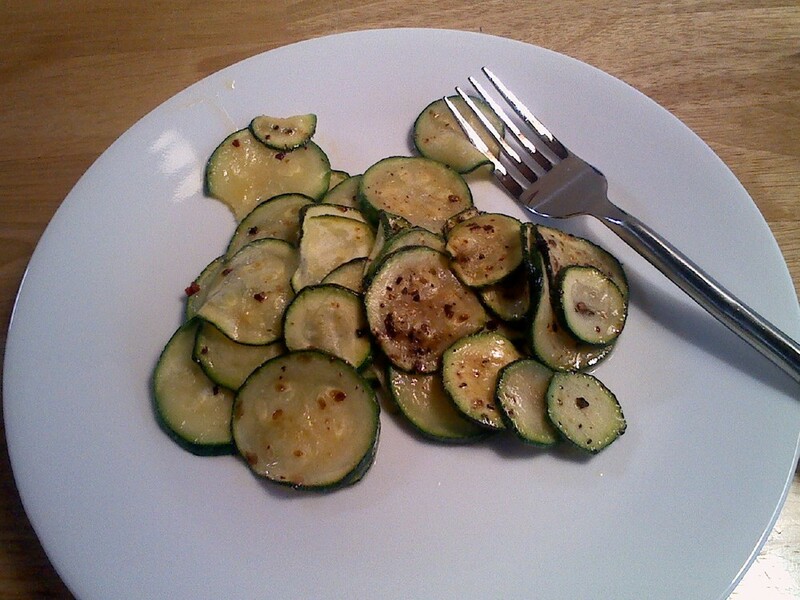 I peeled the outside of the zucchini before slicing it into thin strips- turns out I didn’t have to do it. Skipping that step will save time, and the peeler I was using wasn’t working so well; I got a better peeler. Between not peeling the outside, and having a good peeler, the prep took about 1/3 as long. Lessons learned: Zucchini are also called squash. After scouring the world looking for some stinking zucchini, I realized I had found it. Several times. And never even knew it. Again, shopping has proven to be the biggest frustration. The good news is, one can get better at shopping for food. Everything else is easy. This was seriously delicious. I could not find the necessary baby bok choy, so this was actually just Chinese chicken. I had never steamed meat before, but it’s pretty easy. I started with boneless skinless chicken breasts, cut them in half the long way, and lay them on top of a wire rack above steaming water. Put a lid on top, and pull them off fifteen minutes later. This is easy, in theory, except I didn’t have a wire rack (I commandeered the wire rack from my toaster oven), and I didn’t know when to start the fifteen minute timer. I decided that the water should be boiling before you put the chicken on top of the wire rack, and that is when you start the fifteen minutes. This post represents many, many hours of work. Between reading and trying to figure out what I needed to do and buy, to actually trying to buy the stuff, to cooking and cleaning, a lot of work happened here. But it was worth it. I’m learning my way around a kitchen. Since eating is a pretty regular part of my life, it is worth it to me to get good at it. Even when everything seems perfectly clear, there is still plenty of room for questions. Most questions related to ingredient substitution; I don’t have curry powder, so I’ll try red pepper flakes. No ghee? I’ll go without. I had issues finding all the food that I needed for the meals. I never shopped for more than one meal at a time, even though this meant lots of trips to the store. At the time, I had plenty of time to go to Giant, so my struggle with batching grocery runs was not overly problematic. Fear of failure can be overpowering. I didn’t want to mess these up. It helped that my wife, Kristi, would often make a side, like mashed potatoes or microwaved corn. That took some of the pressure of failure off me. All the fear of failure was entirely self-generated. And Tara Thai is right down the street. And they deliver. If it all does totally hit the fan, just order some take out. Consider it an inexpensive and very local cooking class, and you learned something that does not work. Failure is not so bad. Shopping is an important part of cooking. I never expected shopping to be so hard. I now realize that I must mentally equip myself to go into the store and come out with what I need. There are thousands of choices, and it’s painful walking the entire store looking for one stupid item that you know they have.